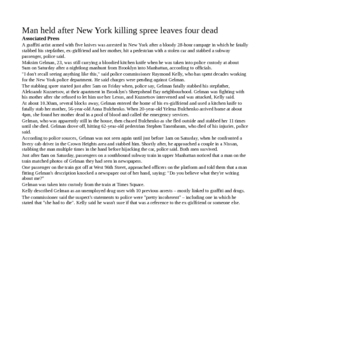 I generally use this 6 page file to re-inforce students' knowledge of the parts of a newspaper article (5Ws 1H, lead, headline, byline, structure, etc. Includes a 2 page checklist that can be copied for the students or used as a note. For lower ability students I turn it into a fill-in-the blank note by simply eliminating high-value words, copying and having students fill in the blanks as I walk through the note. 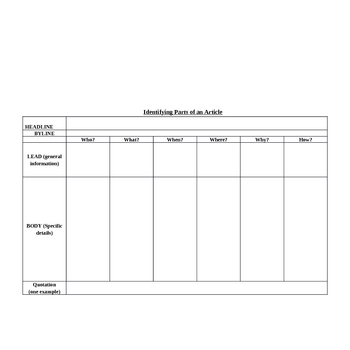 This file also contains 2 activities to further work with the writing form. 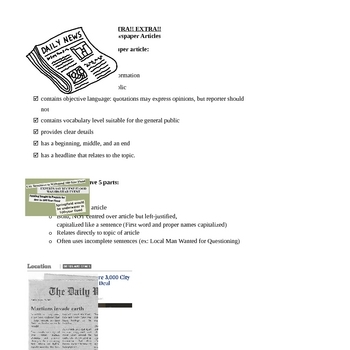 - article #2: students read and fill in a chart identifying the parts of the article.